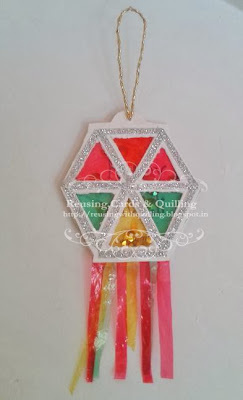 We are happy to have Pooja from Reusing, Cards and Quilling to join us for a fabulous Guest DT post today. 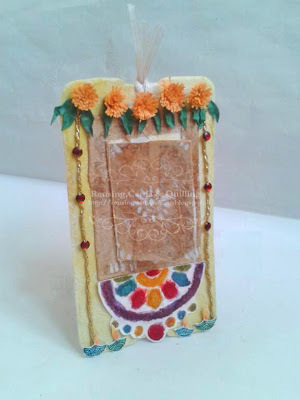 Keeping up with the them of challenge 20 - Tag it All Pooja today is sharing some gorgeous tags she made for a diwali along with a quick pictorial!! Hello friends, Before I share something about me I would like to thank Lulupu team for giving me this opportunity to be Guest Designer for current challenge. 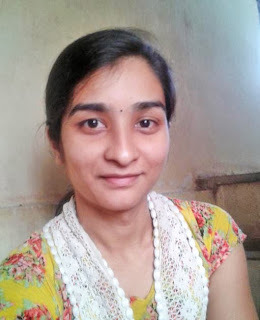 I am a software engineer from Maharashtra and have worked for a leading MNC. Right now I am a SAHD (Stay at Home Daughter :D ) and an Android developer. I also hold a bachelors degree in Mass Communication. I have been crafting since childhood and being academic achiever meant hobbies always came after studies, it’s still the same. I always tried to use the stuff lying around the house and make something useful out of it. This has stayed with me till now. When I came across paper quilling on net I was so fascinated by it that I started following the blogs n eventually started my own blog a year back. 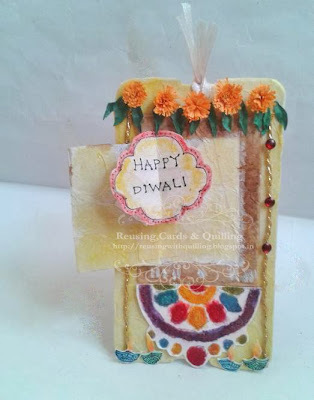 As I am fond of reusing and making cards hence named the blog “Reusing, Cards and Quilling”. 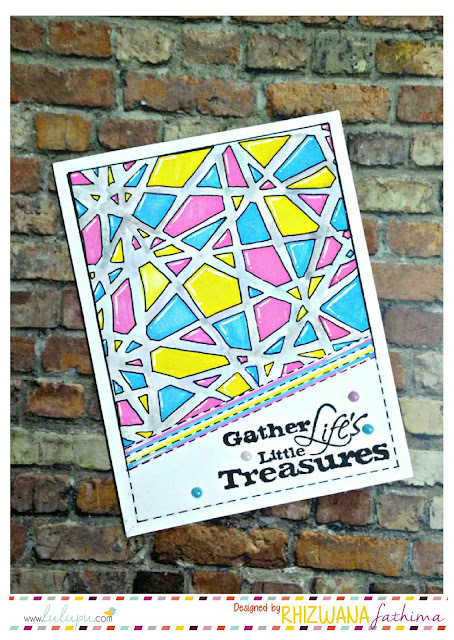 My crafting has improved a lot since then thanks to various bloggers and challenge blogs, Lulupu being one of them. I got to learn about new techniques, products, styles of card making. Still learning and trying to improve. Now on to my contribution. As you all know lulupu team has challenged us to make festive tag/tags with some glitter, bling or shimmer on them. 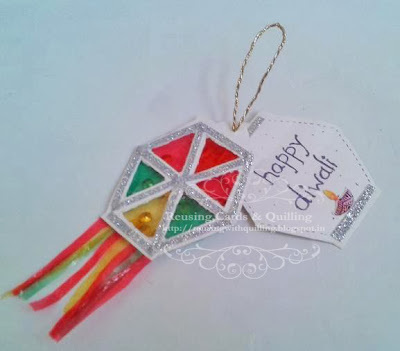 I made two Diwali themed tags. First one is quiet loaded with lots of detailing. When I think of Diwali things that comes to my mind first are toran,rangoli n diyas. (may be bcoz these are my responsibilities :D !!) .I made toran by cutting leaves out of green chart paper and adding fringed flowers to resemble marigold flowers. The rangoli is made of actual rangoli powder( reminded of schools day na ? )Drew small diyas on scrap paper n fussy cut them. I glued a golden thread and added bling to it to resemble lighting . When you open the door a small pop-up wishes’ you Happy Diwali ! I have reused brand tag for making this tag as its very sturdy. Covered it with card-stock and then created texture on it with layers of tissue. Made a door and added a pop –up inside it. Second one is a shaker lantern tag. I have used card-stock to cut the shape. Then glued glassine paper on them and added sequins between them, attached one more flap to write the wishes! The strips at bottom look uneven but they are not, I had hard time keeping them straight ;)! I have glued glitter paper strip to make it look more festive. I hope you liked my tags ! Wishing you all had a pollution free Diwali full of lights & sweets!! Finally got to see you! Loved the door idea in ur tag. Hi Pooja, good to see the lovely face behind all the fab creations....... thanks to Lulupu !! I love your innovations and commitment to R-R-R ( Reduce, recycle and Reuse) !!!! Wow Pooja! You are an all-rounder. :) Great tags. Nice idea to use real rangoli in your first tag. And just loved the shaker idea in the second one. Wow Pooja! You are an all-rounder. :) Great tags. Nice idea to use real rangoli in the first tag. And just love the shaker idea in the second one. Hi Pooja congrats!!.. lovely tags and so beautifully executed ..
Really cool tags..such lovely ideas to give it beautiful festive tuch.. Very nice to know about the person behind the beautiful creations!! Hats off to you Pooja and wish you the best in both your fields!! The tags are lovely and the first one especially since I could identify with the same 3 jobs that I am assigned too when we celebrate at home :) Beautifully made!! So finally get to see Pooja!! Someone I admire tremendously cos she is clever and creative!! Each creation of hers is unique and innovative.Happy that Lulupu is showcasing such a talented crafter!